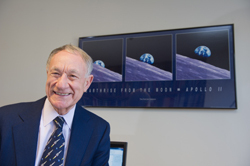 As a graduate student at Columbia University in the early 1960s, Henry Lambright immersed himself in government and political science studies only to discover that his true passion lay a bit farther afield—in outer space. Not surprising, perhaps, at a time when NASA’s full-throttled effort to beat the Soviet Union to the moon had become something of a patriotic obsession and starry-eyed youngsters everywhere dreamed of growing up to be astronauts. Lambright, who worked in NASA’s Office of University Affairs in 1970 before returning to academia, has in recent months enjoyed watching the re-emergence of space exploration in the news as NASA pursues its quest to find evidence of life having existed on the Red Planet. And while its latest robotic explorer, the rover Curiosity, has yet to unearth evidence of what Lambright calls the “chemical indicators of life,” he says the mission itself represents a giant step toward rekindling public excitement for an otherwise flagging U.S. space program. “The Curiosity mission is the single most important mission to Mars since 1976,” says Lambright, who is currently writing a history of the Mars exploration program for NASA—a project that he also plans to incorporate into a book. “The concept is that there are places on Mars that were once habitable, and our orbiting satellites have pinpointed those places. And now we have a rover capable of going to those places, looking for some evidence of the chemicals that would have made it possible for life to exist.” Those indicators, in and of themselves, he says, would not constitute irrefutable evidence of life. But they would very likely lead NASA to take the next step—launching an even more challenging and complex mission to Mars to obtain samples and fly them back to Earth for more comprehensive analysis. Some observers had anticipated that those early indicators might have been found after a spokesman for the project two weeks ago touted findings he said would be “for the history books.” But officials took a more cautious tone at a press conference last week, Lambright says, because apparently it could not be determined with absolute certainty that the substances found had originated on Mars itself or whether they might have resulted from cross-contamination from the rover.